Is CCleaner Still the Best PC Optimizing Tool? CCleaner was launched in year 2004 by a British software development company called Piriform Ltd. This company got its existence in market after launching this product. Realizing its great success, company has developed several cleaning and optimization software for Windows OS and later got into MAC OS and Android systems. Company’s products are widely used by consumers, IT helpdesks, SMEs, MSPs and everyone else who ever wanted to maintain system performance. Numerous software like Defraggler, Speccy, Recuva are led by CCleaner. Since July 2017, the company got acquired by Avast and the product CCleaner got into controversy. CCleaner has proved its worth by over 2.5 Billion downloads worldwide. As per the company, CCleaner cleans over 35,000,000 GB of junk files every month. This product is available in over 55 languages and hits over 5,000,000 installations every week. It not only cleans computer junk files but also takes care of browsers like Internet Explorer, Microsoft Edge, Firefox and Google Chrome. The program also includes a separate tab for registry cleaning. CCleaner is loaded with numerous other features which are discussed down here in this article. As expected, CCleaner Free version comes with the most basic features of the application. It has elementary PC-cleaning abilities and can help you with privacy protection tools to delete cookies, passwords, and temporary browsing files. This version was listed for $24.95 / Year however there is $5 discount available on it, costing it for $19.95. Professional plan has got more options added for Computer Optimization, Realtime System scan, Automatic Cleaning, and Automatic Updates. You do get an option to schedule the cleaning process once when the system is in idle state. 24/7 Phone & Chat Support is also available with this version. 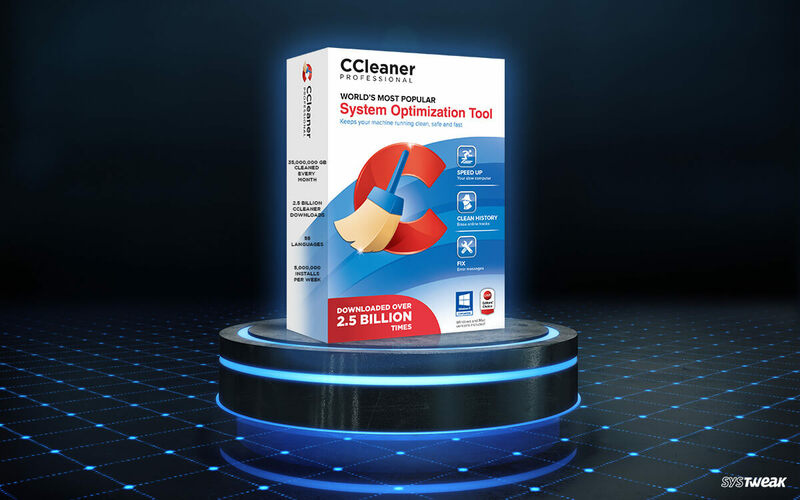 This top of the line product is listed for $29.95 / Year which adds up more features in the list of CCleaner Professional. On top of above features, it also allows you to perform File Recovery, Disk Defragmentation, and Hardware Inventory. Its new version is also equipped with one additional feature to update all your software with one click. Needless to say, but almost all the features listed above are windows features and can perform the same tasks however you will need to bounce through lots of windows functions and sit in front of the screen for multiple commands with patience. The most popular system cleaning tool is surrounded with lots of controversies. Few says the application is hacked to contain Malware and infect systems around while others claim that rival companies paid CCleaner Developer to add infected patch with new updates. Well, don’t worry! The infected version of the application has been pulled off and Avast is deeply investigating the security breach. It is recommended to upgrade the tool to CCleaner v5.56 if you are using v5.33. CCleaner swipes off your system’s unnecessary files, Junk Files & Temporary Files to free up Gigabytes on your system. It is built to deliver a noticeable enhancement in system performance. It eliminates unused files on your PC allowing Windows to run swiftly and free up hard disk space. It also cleans your browsing history, cookies and traces of your online activities. It’s a tool loaded with registry cleaner to keep you away from registry errors. CCleaner download is available with Free and Premium versions to serve your needs. If you don’t want to juggle with multiple windows, this is the best suit for your PC. Review: How Reliable Is LifeLock As An Identity Protector?